Why more rail lines won't prod more folks to take the train - and why we should make peace with cars. As we all know, commuter rail is a Good Thing and the automobile is a Bad Thing. Trains are clean, provide cheap transportation, and get us to our destination quickly and efficiently. They discourage sprawl, with each station serving as a nexus for the "smart growth" so beloved by the new urbanist crowd. Cars, on the other hand, are the polluting, expensive, congestion-producing banes of the environment. One would think, for instance, that new commuter-rail stations might encourage development nearby. It turns out they don’t. Areas around train stations are only modestly more developed than anywhere else. One would also think that new stations might encourage more use of public transit. That is also untrue. The number of people using transit to get to work is largely unchanged by the addition of new stations. Those results may seem counterintuitive but, upon reflection, make enormous sense. Take a look at the MBTA’s lovely color-coded maps of its rail system. All lines run into Boston. That would be smart planning if Boston were where all of the employers were. However, though that may have been largely true a century ago, today just a quarter of the jobs in the metropolitan region are downtown. Instead, you’ll find them along the beltways – Route 128 and Interstate 495 – and at office parks in between. Besides, according to the Bureau of Labor Statistics, a typical worker holds a job for just four years. So, when it comes time to buy a house, there is little value in getting something close to a rail station. After all, most jobs can’t be accessed from one (try, for example, taking the T from Medway to the Westborough Technology Park – it can’t be done). And even if your current job happens to be downtown, the odds are that your next job will be elsewhere. There’s more. 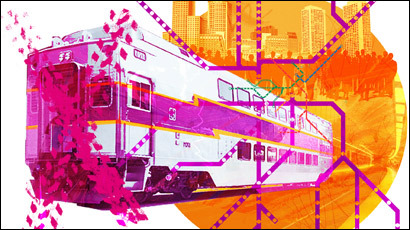 Commuter rail is skewed toward serving the affluent. Unlike buses or subways, rail largely connects well-off suburbanites to downtown jobs in high-paid fields such as finance and law. Moreover, new rail stations have a trivial effect on automobile use, meaning they do little to help the environment. (In fact, according to the MBTA’s own data, commuter rail – which relies on diesel-powered trains – often increases the emissions of nitrogen oxides, which can contribute to the formation of smog.) And travel by rail is not as inexpensive as its advocates would have you believe. If you own a car already, the cost of driving may actually be cheaper. Yet, what’s the alternative? More cars? Perhaps. As Beaton’s study points out, back before widespread adoption of the automobile, rail stations were popular places for development. But cars changed the ways we live and work. Employers began to locate outside of cities, where land was cheap. People moved to the suburbs, lured by the prospect of owning their own plot of land. Today, even with high gas prices and crowded roads, people love the privacy, comfort, and extraordinary freedom they get from their automobiles. Can we put the genie back in the bottle? I doubt it. And if that’s the case, rather than fruitlessly trying to get people out of their cars, perhaps we should simply concede the battle and make the best of it. Encourage carpooling and hybrids, raise fuel standards, introduce congestion pricing on toll roads, and (I know this makes some gasp) expand our highway system. But more commuter rail? That’s just a train in vain. Originally published in The Boston Globe Magazine, December 31, 2006.